From time to time I get requests from readers to review a specific Turntable. 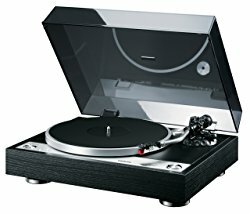 When budget permits, I buy the turntable and review it, otherwise I do an extensive research and share my opinion on the product. This time, Brad Hurley suggested that I review the Onkyo CP-1050 Direct Drive Turntable because he owns this nice turntable and he is very happy with it. I asked him if we would write the review himself. Brad very kindly agreed to write the review. Here it is! For under $400, I would challenge anyone to find a better ‘table than Onkyo’s CP-1050. I suppose you could find an old vintage turntable for less on Ebay. But I’ve done that enough to say with conviction that at best, it’s a crap shoot. The fact is that the technology available today can produce so-called “entry level” turntables that rival or exceed the legends of the distant past. But before extolling the virtues of the CP-1050, a few words. Unfortunately, as well as fortunately, we are in the midst of an analog music renaissance. Why do I say unfortunately? An “analog music renaissance” by any other name is…a trend; and trends are exploited by manufacturers. As a result, there has been an emergence of what may as well be called designer record players. You’ve probably seen these. They look like what you’d expect to see if Apple Computers came out with a line of turntables. They’re very minimalist, over-priced, ultra modern, plug-and-play devices that usually come equipped with a built in preamp, a USB connector, and of course in a variety of high gloss colors. Most of the people who earnestly claim that an old fashioned vinyl record sounds worse than a CD are encouraged to utilize one of these “iTables” connected to a computer (where all things digital have the home field advantage) to support their opinion. But for those who want to experience the clearly superior sound of an analog record, that’s not how you do it. If you want to go analog, you have to go all the way. We can thank the mad men of marketing on Madison Ave for giving us the term “entry level”. The term implies a couple of things. First, it calls to mind something that’s little more than a toy. You could say the term is a euphemism for “beginner version”. Who the heck want’s a beginner version? It’s bound to be crap, right? It also implies that while you could buy this entry-level item, why deprive yourself? “Go ahead. Take the plunge. Do the right thing. Get the $10,000 turntable with the $2,000 cartridge”. Again, verily I say, that’s not how you do it. You’re not buying a car. You’re just buying a record player. This brings me back to the Onkyo CP-1050. Now here’s a proper turntable. Is it perfect? Not according to the rule that nothing is. But it is very good. A turntable has a simple job to do. It has to turn. But it has to turn very very evenly. Any variation in speed ( known as “wow” – a slow rise and fall in pitch, and “flutter”, same idea but faster.) should be minimal enough that it can’t be detected. Such variations are measured as a percentage, the lower the better. Any percentage under 0.20% is desirable. At that percentage, it is still quite possible for some people to detect pitch variances. Once you get down to around 0.15% or less however, the pitch will be so steady that it’s not an issue. The CP-1050’s wow and flutter sits right in there at 0.15%. The full specs are provided below. Now being the proper turntable that it is, it does not have a built-in preamp. So if you don’t have an amplifier with a dedicated phono input, you’ll either need to obtain one, or purchase an outboard phono preamp. Plug the turntable into the preamp. Then, plug the preamp into the Auxillary Input or Tape Input of your amplifier. While it technically comes complete with a cartridge, you are strongly encourged to act as though this isn’t the case. 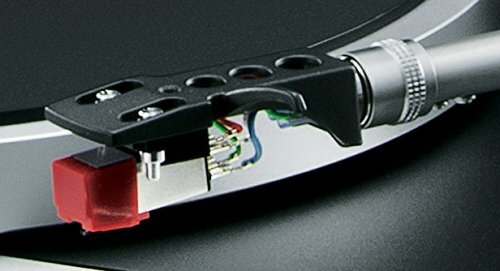 Fortunately, being the proper turntable that it is, it has a detachable headshell making it easy work to replace the supplied cartridge with one worthy of the title. Plenty of perfectly good cartridges can be had new for less than $100. I attached my trusty Shure M97xe. 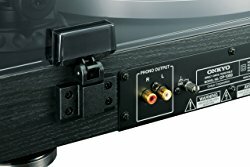 I’ve read a few other reviews of this turntable that mention some play in the tone arm. I have to say though that in my case, the tone arm is quite solidly attatched. Perhaps there was an issue with this early on that has since been resolved. The tone arm itself is aluminum and of the “S-Shaped” type. This is kind of a throwback. Most of the turntables made today have the straight or “J-Shaped” style tone arm. I’m not sure why. The advantage of the old “S” shape tone arm is the extra mass associated with being longer than a straight arm. Having more mass, the “S” shape tone arm is able to maintain more stable vertical tracking of the record groove. The arm has an adjustable counterweight to accommodate the stylus pressure of whatever cartridge you attach. And it does have a bias ( or anti-skate ) adjustment to match. The feet of the CP-1050 provide surprisingly good isolation from exterior vibration. They’re also adjustable to allow for setting the table up good and level. This is a fully manual TT. You have to lower the stylus ( with the dampened lever please), and raise the stylus yourself. You also must start and stop the platter yourself. But this is a good thing. Why? Fewer moving parts lower the odds of something failing. I love this TT, as you can no doubt tell. I use it as my primary one now. I reccommend it to anyone wanting to re-live the experience of uncompressed analog sound, or to those of you under 30, who may have never experienced music the way God intended – one side at a time.